How Common Are Slip And Fall Injury Cases In Missouri? Slip and fall injury cases are very common in Missouri. In fact, more are not reported than actually happen. People slip and fall all the time. Sometimes it’s because of their own fault and sometimes it’s because of their own inattention to certain details. There are some slip and falls that happen purely at no fault of your own. I can go on to various circumstances on how they can happen but they’re more common than you would think. What Is The Legal Standard Of A Premises Liability Claim? The legal standard of a premises liability claim is one of changing standards. It seems to me that every year there is a case that comes out and talks about a different standard of applying or maybe changing the standard to some degree, but the standard is one of negligence. Negligence is whether someone reasonably did not use the standard of care or did something they shouldn’t have done or didn’t do something they should have done; that’s a negligence standard and it applies to any slip and fall case. As to a premises owner, basically that standard could be whether or not the sidewalk was raised to a sufficient height; maybe there was a hole in the sidewalk; maybe there was something wet on the floor or maybe neglected to take care of the problem. It goes on and on and on but the standard is really one based on negligence whether someone did something or didn’t do something that should have been done or not done. What Conditions May Cause A Slip And Fall To Occur? Carelessness on the store owner watching over his or her store’s condition that may cause a slip and fall to occur. Many times, particularly with the store owners, you have slip and falls where there are spills in the aisles but no one takes care of it; or there’s something that’s been laying in the aisle for a long time and no one removes it. It could be something as simple as an object that’s been in the aisle but it’s too low to see for the average person because their eyesight is looking at another object at the top of the shelf; or something foreign is on the floor that should not be there or was not placed properly. A lot of things can occur that would cause an accident such as this, a slip and fall in a store, to happen. Why Is It A Good Idea To Seek The Assistance Of An Attorney After A Slip And Fall Accident? 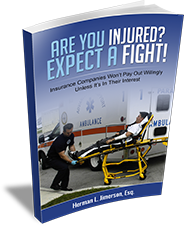 The standard is whenever you’re injured, PERIOD, speak with an attorney. I believe I have spoken about this in other areas, but people think they can resolve their own issues and that is probably the worst scenario. Abraham Lincoln said something like this, “He who represents himself has a fool for the client”. What is meant by this simply is that you are not really positioned or capable of really handling both sides of a matter. One, you’re personally involved; and two, there may be some professional/legal issue that you may need to address. If they’re all coming at you at one time, you may not be the best person to present those issues. The best time to contact a lawyer is when you have an injury from something that you believe is caused by the negligence of another. What Are Some Examples Where A Store Owner Would Not Be Held Negligible For A Slip And Fall? The law is changing all the time, but certain things where a store owner would not be held liable for a slip and fall is when, for example, you see the wet floor signs- these caution floor signs, the yellow placards that they have out in three different languages about caution. Basically, the bottom-line is if you see something that puts you on notice that there might be a dangerous condition then the store owner’s liability is lessen because that person, the customer, has been notified that there is a dangerous condition. You should not walk over or disregard the sign. If that customer doesn’t pay attention to it then the store owner may not have the liability for any injury that occurs due to the inattention. Other issues can be whether the store owner has third-party liability. For example, someone comes into the store and they’re deranged or there’s something wrong, i.e., they’re acting in a very criminal way. Is the store owner liable for a third-party type of action against a customer? The answer is probably not because they did not have notice of that behavior. The issue is “notice.” If the premise owner has reasonable notice of an event, then there might be the liability for third-party action. The law is changing. For example, a case that came out maybe a couple of years ago that talks about if you undertake a matter to rectify something, for example, such as a snow removal and you clean your sidewalk. If you fail to do a good enough job and someone falls on it then you’re liable for it. Now, if you don’t clean your sidewalk and someone walks on it because they see snow on it and they fall, you may not be liable. The question is am I liable for undertaking the matter or am I liable for not undertaking the matter? The landscape is really changing as to where liability lies. It’s a jury type question and it’s a question that needs to be addressed by the legislature as to what the terms of the liability can be for a premise owner. For more information on Slip And Fall Injury Claims In Missouri, a free initial consultation is your next best step. Get the information and legal answers you are seeking by calling (314) 786-3536 today. How Does Comparative Or Contributory Negligence Apply To A Slip And Fall? Home > Personal Injury > How Common Are Slip And Fall Injury Cases In Missouri?